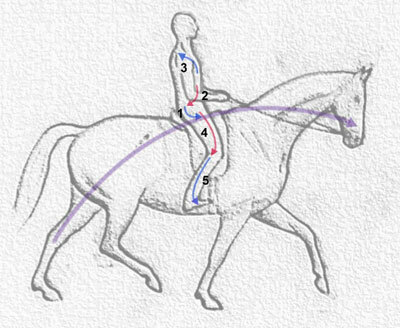 This diagram explains dressage rider biomechanics in terms of a series of counter-balanced postural directions. Our study of the posture that allows the rider to balance with the horse's movement, and bring the movement into balance, without relying on the reins, has led us to the discovery that the different parts of the rider's body must act and engage with the horse in either a forward or a backward direction. If the blue curves on the diagram were part of a circle, rolling in the direction of the arrow, these circles would all be turning in the same direction. These blue lines represent the parts of the rider's body that engage with the horse in the direction of the longitudinal transmission (from back to front), i.e. 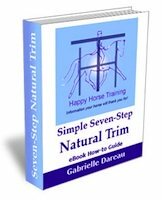 the lower leg (5) strokes forwards on the horse's sides, the seatbones (1) follow the oscillation of the horse's spine from back to front, and the chest (3) lifts bring the thoracic spine into the same direction. The red lines follow an opposing direction of rotation, and these represent a backwards postural engagement, which stabilise and balance the posture. The abdominals (2) engage down and back, lifting the front of the pelvis into engagement and allowing the lumbar back to stretch and relax with the movement, and the thigh (4) stretches back equally, in order to support the seat and upper body, and bring the lower leg into the right position where it can aid in a forwards direction without pushing out in front (the so-called 'chair seat'). 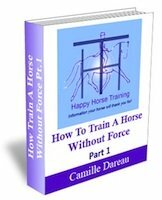 This diagram, of course, only represents one dimension of the rider's interaction with the horse - the longitudinal one - the rider must combine it with the correct lateral interaction in order to effectively channel the horse's energies towards postural engagement. 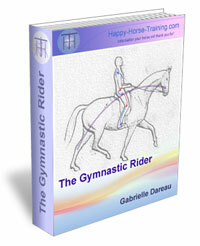 For a complete and totally unique guide on how to put this way of riding into practice, find out about The Gymnastic Rider eBook from HHT.